I’m an avid reader of monoceros weblog, a blog which I had stumbled upon by accident while googling “Corrinne May”. I was immediately drawn to Vanessa’s (the author) elegant yet simple style of writing, which I very much prefer to Singapore’s most famous blogger (let it snow, let it snow, let it snow…), and have been surfing regularly to her blog ever since. 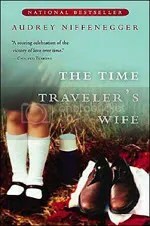 In one of her postings, she waxed lyrical about a book, The Time Traveler’s Wife, and her review, together with the synopsis, piqued my interest. I finally bought the book recently, thanks to my 20% discount coupon from Kinokuniya. And she was right, the book is indeed excellent, and I was left wondering why it took me so darn long to buy it. Imagine this: Clare meets her future husband, Henry, when she was six and he was 36. When they were married, she was 22 and he was 30. How is that possible, you ask. The premise of the book is that Henry suffers from a genetic disorder, causing him to time travel. He gets pulled back into the past or hurtles forward to the future, by neither his will nor control. He brings nothing with him when he travels but his own self – no clothes, no money, nothing but flesh, skin and teeth. While it sounds incredulous and totally sci-fi, rest assured that it is not. Author Audrey Niffenegger delves deep into an exploration of Clare and Henry’s relationship, weaving a tale about the intense joy and love they share while together in past, present and future, the piercing worry – and sometimes jealousy – that Clare feels whenever Henry disappears and the heartbreaking trials and tribulations they go through in their quest to remain as “normal” as possible. The narration alternates between Clare and Henry, bringing the reader into the bizarre yet poignant world that they share. The book leaves you pondering about the nature of Time, and its fluidity. Time is both consecutive and concurrent, the past, present and future are co-existing in the same realm. Time is not absolute, it flows and changes at will. Time loops and is also parallel to itself. While Vanessa felt that the book was reminiscent of the Korean hit movie, My Sassy Girl, the movie that came to my mind immediately was the critically acclaimed Before Sunset, which I so loved. Like the movie, I had felt as if I was quietly observing the world of Clare and Henry as someone who knew them. With every turn of the page, I found myself pondering their fates, hoping against hope that they will beat the odds. This is truly one of the most compelling reads I have ever come across. Don’t believe me? Try a sample chapter and you will definitely be hooked. The rights to the book were apparently bought by Brad Pitt and Jennifer Aniston, pre-divorce.